Our personalized fingertip towels are optimal if a wash cloth is too small or if a hand towel is too large; it is the perfect in between size!! They are ideal for hanging on smaller fixtures in guest bathrooms. 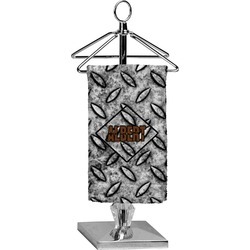 Drape them over handtowels for decoration or use them for drying hands in the bathroom. Personalize them with an intial, name, or monogram for an elegant touch. The towels are absorbent cotton and have a gorgeous design on the front. You can also make a classy statement at a dinner party when you use these towels alongside a finger bowl. Beautiful!! Love these tip towels. Great quality, colors are perfect! Very cute towel. However it is too small. The monogramming can barely be read. It's ok. I thought the hand towels appeared nicer on the website than when I actually received them. Fair quality.